Lauren Arthur came away from her experience with Teach for America knowing that she wanted to get into politics. Arthur started as a middle school language arts teacher at the Urban Community Leadership Academy charter school through Teach for America in her native Kansas City in 2010. She went into the program seeking to help students from under-resourced communities. 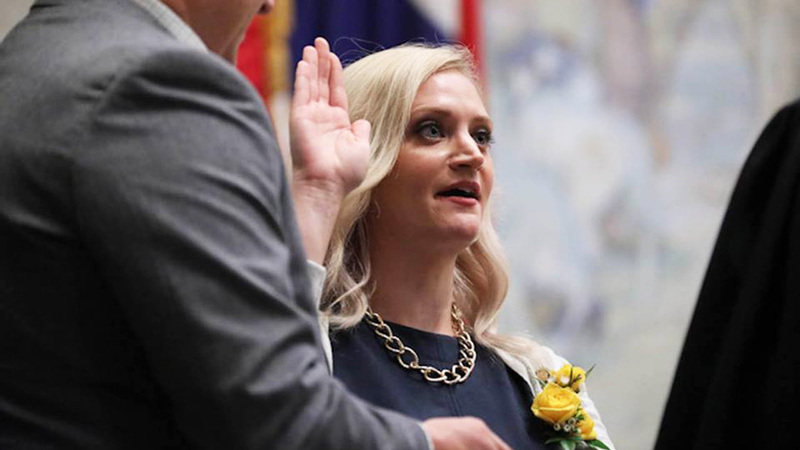 During her time teaching she realized that, while she could make a sizable impact in the classroom, she could make an even bigger one in the Missouri General Assembly. Through the University of Missouri–St. Louis College of Education’s partnership with Teach for America, Arthur paired her teaching experience with progress toward an MEd in secondary education, which she earned from UMSL in May 2013. In November 2014, the Democrat won election to the Missouri House of Representatives and, in a special election in June, she won her race for the State Senate by nearly 20 points. Arthur took her oath of office, representing the area north of Kansas City, on Sept. 12. She is not forgetting what drew her to this line of work in the first place: pushing for universal pre-K in the state is high on her list of priorities. Tom Stephens, an assistant teaching professor at UMSL and an advisor in the school’s Teach for America Kansas City program, said Arthur is the first of his students to become a politician. He keeps track of all of his former advisees and has seen them follow entrepreneurial pursuits, go to law school or medical school and, of course, continue teaching or become school administrators. He feels that, with the amount of say the Missouri General Assembly has in charting the direction of the state’s educational system, it’ll be beneficial to have another legislator like Arthur, who has a theoretical and practical understanding of the issues that face Missouri schools. UMSL has been a university partner of Teach for America since 2006. Every year, around 175 candidates are placed in St. Louis and Kansas City, starting their teaching careers at schools that serve students who find themselves at the wrong end of the nation’s educational inequities. The partnership with UMSL allows Teach for America candidates to take the necessary coursework to earn their certifications within two years and also leaves them in advantageous positions to pursue their master’s degrees. During her stint in the Missouri House of Representatives, Arthur sponsored bills on issues such as appropriate health care for children in foster care and ensuring taxpayers receive the same interest on their refunds if the Department of Revenue is late in sending the return as they would be expected to pay if they submitted their taxes late. She’s looking forward to working across the aisle in her new role, keeping education at the forefront.